Whether it is to install a more performance-conscious custom ROM or set an app to kill other apps after every few minutes, folks with older Android devices can use a wide variety of methods to get more juice out of their device. 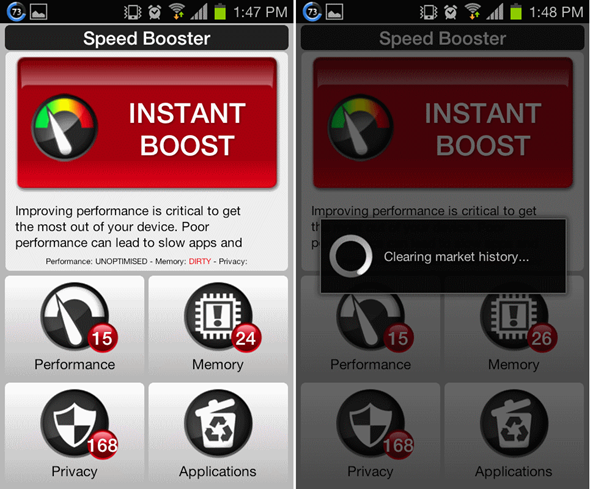 Now, another potential method has emerged in the form of apps that claim to be “Speed Boosters”. We came across one earlier today and tested it to see if it’s any good. Check our review after the jump! 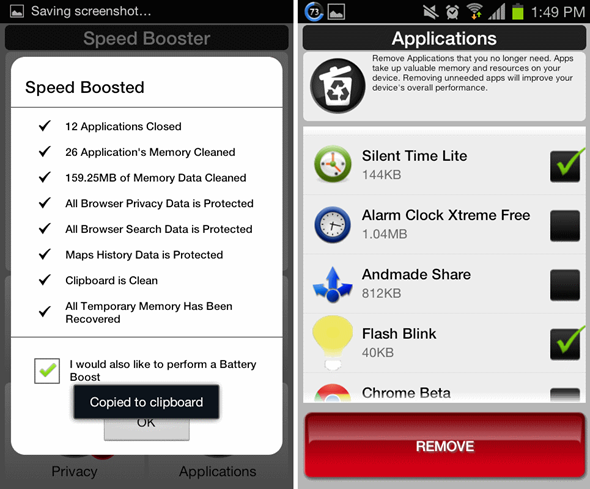 Developed by Silver Spark Studios, Android Speed Booster is a free app [Google Play] that, as you may have guessed from its name, aims to boost the performance of your Android device by up to 100% (Guaranteed!). Does it, though? All that and more, discussed below! 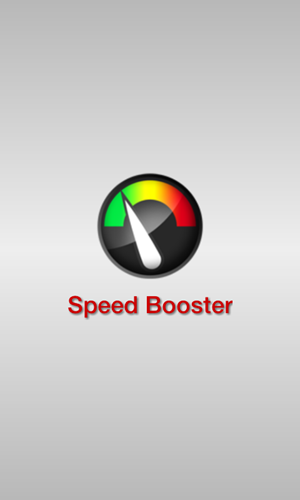 Speed Booster comes with a very nice, straightforward user-interface. The main menu comes with a single Instant Boost button that optimizes everything, along with four smaller buttons which let you boost performance, privacy, memory and manage apps separately. Protects “browser privacy issues”. The developer hasn’t specified what they mean by “privacy issues”, but it is most likely cache, history, cookies, saved passwords/forms. “Cleans memory” by recovering memory from apps stopped sometime ago. Most of these are things you can do by yourself. Speed Booster just puts them under one button. The last but, in my opinion, most awesome feature is tucked away under the Applications menu in Speed Booster: the ability to select a bunch of apps and uninstall them in one go. This alone makes Speed Booster a highly recommended app. Does Speed Booster improve performance? I’d say yes, but don’t expect the app to turn an HTC Desire into an HTC One S.
Don’t forget to let us know what you think of by leaving a comment over on our Facebook and Google+ page! Appriva Privacy Antivirus For Android Offers Cloud-Powered, Performance-Conscious Mobile Security – Download Now!